BRKV – What do Hotforex reviews say? Should we trade with Hotforex? Are they scam brokers? These are the questions traders want to know when considering whether to decide if they should work with Hotforex. Unfortunately, you can never find the exact answers to those questions on the Internet. If you search for the phrase “Hotforex reviews”, there will be tons of websites that rate the brokers and for each topic there will be a lot of bad comments on the brokers. But the truth is the comments are depended on your personal attitude. When something wrong happens, you’ll want to find a place to blame and that is when you leave bad comments for the brokers. If all things is fine, there’s nothing to talk about so there are no good comments on the brokers. As a result, if you want the actual review, you cannot go around and read every comment and believe them. There are still a lot of brokers that are praised; however, these brokers may not be that good because they are suitable for other traders but not for you. Some brokers can be amazing in America but in Asia or Africa, they are not that good anymore because it depends on your trading strategy and the number of brokers in your country. For example, US brokers are the best in their country, but they aren’t the same to African or Asian countries because in these countries, they do not have the license or they don’t even develop the local support, payment systems there. 1 Which forex brokers are suitable? Which forex brokers are suitable? Choosing the suitable forex broker is more important than choosing the best forex broker. For example, a US broker with US regulation is good for traders from US but not for traders from the rest of the world. Like I said, the most suitable brokers depend on your trading strategy. If you want to deposit and withdraw quickly, you should go with the brokers have the quickest payment systems with low fees in your country. Or if you are professional traders that trade millions, then the brokers with lower spread or low swaps are the better choice. In the case that you are gamblers that like to trade when there is sudden event or big news, choose the high leverage brokers. And if you trade with robots, definitely go with robot trading brokers and trade with Cent Accounts. Clearly, for beginners, they should pick the brokers with PAMM accounts. When talking about a broker’s reliability, it’s the regulations we are talking about. Regulations are the license that trusted financial organizations grant to brokers to make sure those brokers meet the standard and can protect traders. A broker shouldn’t have too many regulations. They just need a regulation from the market they’re targeting. Hotforex is one of the rare brokers that just focus on the Asian market, especially Eastern and South East countries such as Thailand, Indonesia, China, and Vietnam… However, since those countries don’t have regulations, Hotforex just need one trusted regulation. Hotforex currently have acquired three trusted and famous regulations, which are CySEC, FSCA, and FSC. Especially with FSCA, a South African regulation, South African traders can rest assure that they can trade safely and legally with Hotforex. Although their main market is in Asia, they are one of the biggest retail brokers with the daily average trading volume at about $200 billion. More information about biggest broker in the world here. For Asian traders, Hotforex offers many advantages: forex trading with the lowest spread, gold trading with spread at only 22 pips (the lowest); the excellent supports systems, as they have local offices in most South East countries and they have various payment methods. Learn more about Zero spread account here. For Hotforex fixed spread account, the spread is only 1.8 pip for EUR/USD, which is relatively low compared to other fixed spread accounts from other brokers. You should notice that it is not wise to compare fixed spread accounts with regular accounts because in normal trading conditions, regular accounts’ spread is clearly lower than that of fixed spread accounts. Therefore, the fixed spread of Hotforex is much better than other brokers’ fixed spread. Learn more about fixed spread accounts here. BRKV – It is normal for brokers to have slippages and they often happen when there are some big news that cause changes to the market price. Slippages mean you entered a price but the order is executed at a different price. This happens because the market price changes so quickly and dramatically that there is a huge difference between the price you input and the price the order closes at. Slippages occurs more regularly with brokers who execute orders slowly. Actually, there are many brokers who would slow down the execution to reduce their risk because it takes time for the quote value to go from liquidity providers to the brokers and then to the traders. Of course, Hotforex still have slippage but the level is reasonably small and traders hardly complain about that problem. 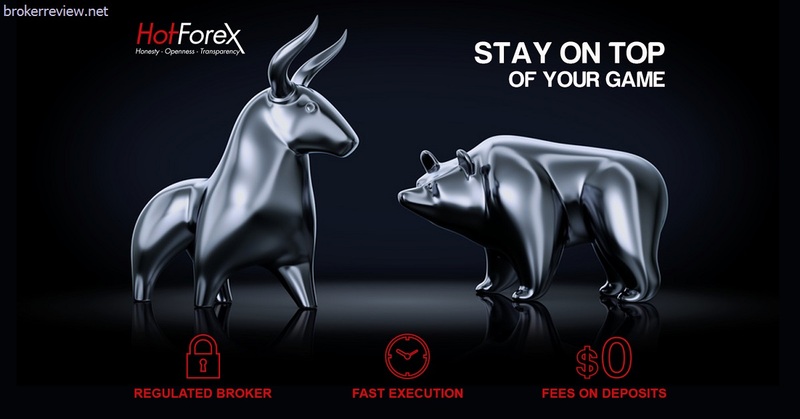 Hotforex has small accounts that with only the deposit of $5, traders can start trading >>> More details here. With VIP account, the spread is even 0. This account can be considered as a form of ECN account from dealing desk brokers. As you know that ECN accounts are perfect for experts. If you are just experienced traders, you should trade with VIP account, because it is designed for big trades so the spread is low, the execution speed is fast and the quotes are a little better the ECN accounts >>> More details here. Fixed spread accounts are for traders who like to trade when the market fluctuates strongly. However, be aware that if there are big events happening such as US or UK elections, the spread will still changes, which means the fixed spread is not always fixed but it is a lot more stable than other kinds of accounts >>> More details here. Support is important when choosing a broker. When trading, a lot of problems may occur so the slow support can affect your investment or even burn your account, or unqualified staff can take you a very long time to deal with your problems or sometimes not solve them at all. Hotforex is famous for the amazing supporting staff and they also have offices in Vietnam, Thailand, and Indonesia… Besides, they also have monthly conferences for clients. Therefore, any problems from traders can be handled within a short time. Go here for more details about Hotforex conference. This is an interesting account for investors and amateur traders. All you need to do is creating an account here. Then go to the list to see which traders are doing well with stable and safe profit rate. After that, you just need to copy their executions. If they win, you’ll win too because you have the same execution as them. More interesting contests on Facebook and trading contests here. It is amazing that Hotforex is the only big broker that applies this program! Usually, brokers say that they will not charge any fees when you deposit or withdraw; however, you still pay some percentage of fees. For instance, when you deposit by Credit Card, it will cost you 3 – 4% of your deposit amount. That fee will be charged by banks and Visa agencies. With Hotforex, when you deposit and have to pay these charges, you can send back the invoice and they will pay you back the money. Actually, the fee amount is not small as you deposit $10,000, the fee can be about $350. More about the free withdrawal and deposit programs here. How much are Exness spreads and commission? What regulations does FxPro have?